Investing in small cap stocks has historically been a way to outperform the market, as small cap companies typically grow faster on average than the blue chips. That outperformance comes with a price, however, as there are occasional periods of higher volatility. The fourth quarter of 2018 is one of those periods, as the Russell 2000 ETF (IWM) has underperformed the larger S&P 500 ETF (SPY) by nearly 7 percentage points. Given that the funds we track tend to have a disproportionate amount of their portfolios in smaller cap stocks, they have seen some volatility in their portfolios too. Actually their moves are potentially one of the factors that contributed to this volatility. 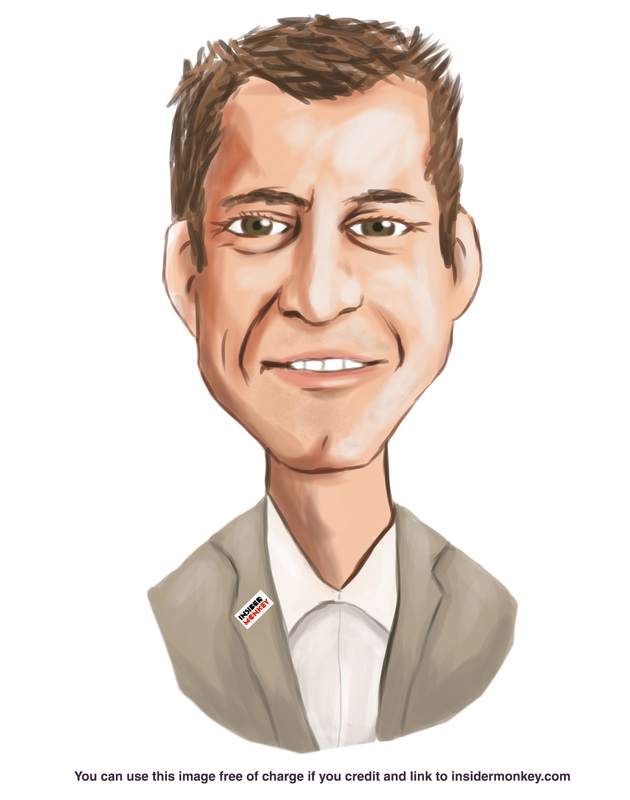 In this article, we use our extensive database of hedge fund holdings to find out what the smart money thinks of Keurig Dr Pepper Inc. (NYSE:KDP). Keurig Dr Pepper Inc. (NYSE:KDP) has experienced a decrease in support from the world’s most elite money managers recently. 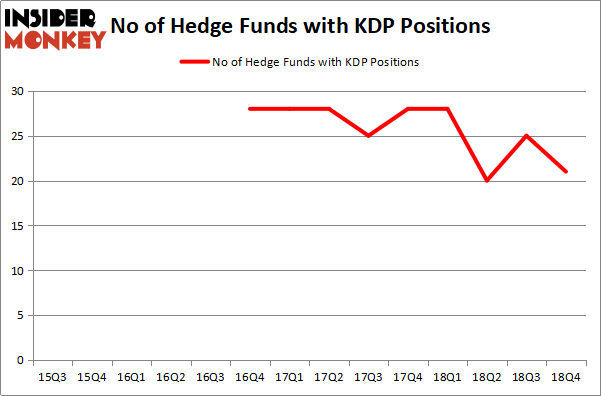 Our calculations also showed that KDP isn’t among the 30 most popular stocks among hedge funds. We’re going to take a glance at the fresh hedge fund action regarding Keurig Dr Pepper Inc. (NYSE:KDP). What have hedge funds been doing with Keurig Dr Pepper Inc. (NYSE:KDP)? Heading into the first quarter of 2019, a total of 21 of the hedge funds tracked by Insider Monkey were long this stock, a change of -16% from one quarter earlier. Below, you can check out the change in hedge fund sentiment towards KDP over the last 14 quarters. So, let’s find out which hedge funds were among the top holders of the stock and which hedge funds were making big moves. Among these funds, Cedar Rock Capital held the most valuable stake in Keurig Dr Pepper Inc. (NYSE:KDP), which was worth $278.8 million at the end of the third quarter. On the second spot was D E Shaw which amassed $125 million worth of shares. Moreover, Arrowstreet Capital, Renaissance Technologies, and Two Sigma Advisors were also bullish on Keurig Dr Pepper Inc. (NYSE:KDP), allocating a large percentage of their portfolios to this stock. Seeing as Keurig Dr Pepper Inc. (NYSE:KDP) has experienced bearish sentiment from the entirety of the hedge funds we track, logic holds that there is a sect of money managers that decided to sell off their positions entirely by the end of the third quarter. At the top of the heap, Barry Rosenstein’s JANA Partners dumped the largest position of all the hedgies monitored by Insider Monkey, valued at about $75.2 million in stock. Mitch Kuflik and Rob Sobel’s fund, Brahman Capital, also sold off its stock, about $64.4 million worth. These moves are important to note, as total hedge fund interest dropped by 4 funds by the end of the third quarter. Let’s now take a look at hedge fund activity in other stocks similar to Keurig Dr Pepper Inc. (NYSE:KDP). These stocks are The Blackstone Group L.P. (NYSE:BX), Capital One Financial Corp. (NYSE:COF), Carnival Corporation (NYSE:CCL), and Micron Technology, Inc. (NASDAQ:MU). This group of stocks’ market values resemble KDP’s market value. As you can see these stocks had an average of 44.25 hedge funds with bullish positions and the average amount invested in these stocks was $1576 million. That figure was $566 million in KDP’s case. Micron Technology, Inc. (NASDAQ:MU) is the most popular stock in this table. On the other hand The Blackstone Group L.P. (NYSE:BX) is the least popular one with only 33 bullish hedge fund positions. Compared to these stocks Keurig Dr Pepper Inc. (NYSE:KDP) is even less popular than BX. Clearly hedge funds soured on the stock over the last couple of years. Our calculations showed that top 15 most popular stocks among hedge funds returned 19.7% through March 15th and outperformed the S&P 500 ETF (SPY) by 6.6 percentage points. Unfortunately KDP wasn’t in this group. Hedge funds that bet on KDP were disappointed as the stock returned 8.6% and underperformed the market. If you are interested in investing in large cap stocks, you should check out the top 15 hedge fund stocks as 13 of these outperformed the market. Were Hedge Funds Right About Dumping FedEx Corporation (FDX)? Is Vertex Pharmaceuticals Incorporated (VRTX) A Good Stock To Buy? Were Hedge Funds Right About Ecolab Inc. (ECL)? Is Illinois Tool Works Inc. (ITW) A Good Stock To Buy? Were Hedge Funds Right About Selling Northrop Grumman Corporation (NOC)? Were Hedge Funds Right About Getting Into Bank of Montreal (BMO)?